How can I change some words in theme, like for example "Find Job"
If you want to use WorkScout in English, and you want to change some texts, obviously it's not possible to translate theme from Englisht to English ;) Currently the best way to do it is to use plugin Say What. Go to Tools -> Text Changes, click Add New. 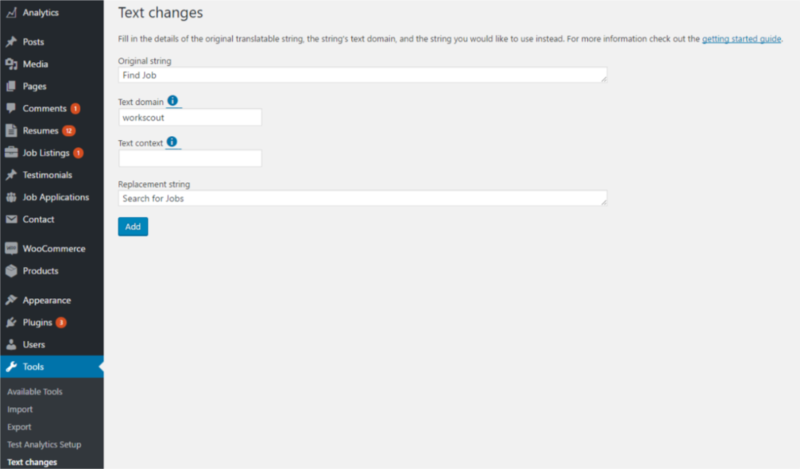 In form you'll see you have to put original string, (letter size matters here), textdomain (for text from theme it's just 'workscout') and text you want to change it to. Click Add and that's pretty much it, your new text will replace the text from theme. You can use it for plugins also, but you just need to use proper textdomain.